Your body/mind is highly intelligent. Specific stress trigger, emotions and beliefs affect your specific organ tissues. Healing goes through specific points and phases. This latter point is what I want to tell you about. According to META-Health, healing goes through specific points, levels and phases. You start with the natural state of the body: health, with normal day activity and night relaxation. Then perhaps some kind of stress trigger happens, such as a trauma or a UDIN (Unexpected, Dramatic, Isolating, No Resources/Solution type incident). The trigger can also be a conditioned reflex based on some inherited trauma in cellular memory (what we call "hidden memories," which could be in utero, generational, a birth trauma and very early memories that are recorded in the cell's information energy pattern). When this happens, you move into the Stress Phase, where the Sympathetic Nervous system (fight/flight/freeze) becomes dominant, and there is some kind of conflict (often internal and unconscious). Here's the interesting part. 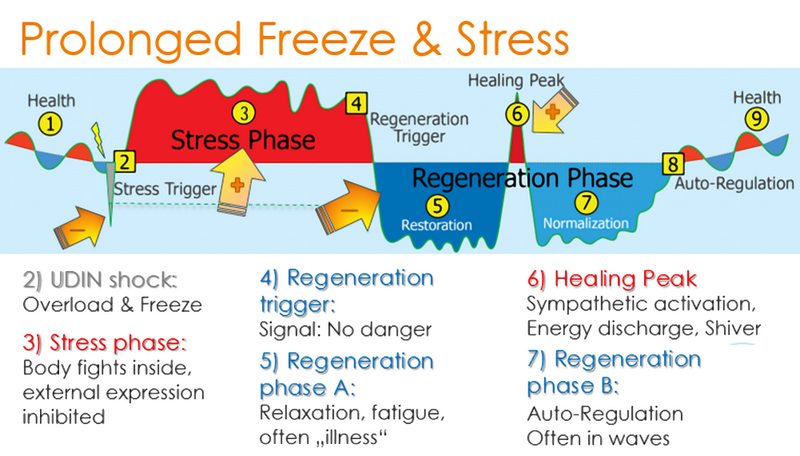 If you introduce some kind of Regeneration Trigger, such as The Healing Codes or some intervention that truly addresses the situation at its core, you can move into Regeneration Phase A. Here the "stress" is passive, your Parasympathetic Nervous System (rest and repair) system becomes dominant. Here's the kicker, though: This Regeneration Phase A is when the symptoms can show up! And in fact, they may get even worse. In META-Health they call this the Healing Peak. (Healing Codes jargon calls it a Healing Response.) You may feel like you're getting worse, but you're actually getting better! In fact, the next phase is Regeneration Phase B, where the PNS is again dominant, and excretion--getting rid of the problem--actually happens. 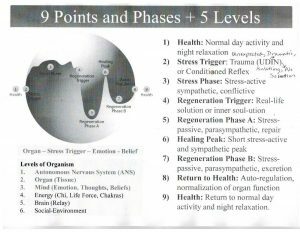 Phase 8 is the Return to Health, in which your system is auto-regulating and organ function becomes normalized. This often happens in waves, by the way. It's not a steady, even process. Which leads finally to the last stage: the Return to Health and normal day activity and night relaxation. You have plenty of energy in the day, and you sleep well and get restored at night. So in this system, as with The Healing Codes, we're always looking for that original stressor--that trauma, that Original Event that caused the brain to register a stress response. When we address that, the body begins to move toward health, and as it does so, physical things come up. We think we're getting sick, but we're really getting better at the point when the symptoms show up. A fever is a good example. When some infectious agent enters the body, the body responds with a fever to raise the temperature to kill off the attacker. You think you're sick, and maybe take some aspirin or ibuprofen, but that actually blocks what the body is trying to do. If we can respect the body's wisdom, find and address the root cause (the trauma or trigger), we begin this regeneration process. Isn't that wonderful news? Doesn't that give you great hope? When the symptoms show up--that's when your healing has started! It does take a big paradigm shift, though, for many people. All I can say is, "Try thinking this way." Try going for the original trauma by asking, as we counsel with The Healing Codes, "How do I feel about this condition?" Then trace that feeling back to other times you felt this way (about anything), and use The Healing Codes and prayer to heal that negative memory, image, or belief. 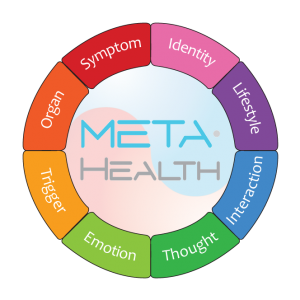 META Health, the New German Medicine, functional medicine, energy medicine--all these approaches seek to find and heal the original cause, rather than try to make symptoms disappear. Will you trust your body's and your heart's innate intelligence, and look to heal the SOURCE of whatever bothers you? I hope you will. And if you need some help with this, I suggest you sign up for the free "Getting Started with The Healing Codes" and visit my site at https://healingcodescoaching.com to find out more. For more personalized help, consider getting a Custom Healing Code and coaching to find those "original events." Here’s a totally different view of symptoms than I’ve ever heard. If it’s accurate, it turns everything about the way we think of illness and disease on its head. Most of all, it gives great hope to anyone who has been diagnosed with a disease or condition. This comes from an interview with Dr. Craig Weiner from the Autoimmune Vitality conference. (Part 1 has ended, but you can still sign up for Part 2, which starts on May 21.) I highly recommend listening to him–or getting the whole series, which has been fantastic. Dr. Weiner is, among other things, a Level 2 META-Health Practitioner certified through the International META-Medicine Association, IMMA. This latter point is what I want to tell you about. According to META-Health, healing goes through specific points, levels and phases. You start with the natural state of the body: health, with normal day activity and night relaxation. Then perhaps some kind of stress trigger happens, such as a trauma or a UDIN (Unexpected, Dramatic, Isolating, No Resources/Solution type incident). The trigger can also be a conditioned reflex based on some inherited trauma in cellular memory (what we call “hidden memories,” which could be in utero, generational, a birth trauma and very early memories that are recorded in the cell’s information energy pattern). When this happens, you move into the Stress Phase, where the Sympathetic Nervous system (fight/flight/freeze) becomes dominant, and there is some kind of conflict (often internal and unconscious). Here’s the interesting part. If you introduce some kind of Regeneration Trigger, such as The Healing Codes or some intervention that truly addresses the situation at its core, you can move into Regeneration Phase A. Here the “stress” is passive, your Parasympathetic Nervous System (rest and repair) system becomes dominant. Here’s the kicker, though: This Regeneration Phase A is when the symptoms can show up! And in fact, they may get even worse. In META-Health they call this the Healing Peak. (Healing Codes jargon calls it a Healing Response.) You may feel like you’re getting worse, but you’re actually getting better! In fact, the next phase is Regeneration Phase B, where the PNS is again dominant, and excretion–getting rid of the problem–actually happens. Phase 8 is the Return to Health, in which your system is auto-regulating and organ function becomes normalized. This often happens in waves, by the way. It’s not a steady, even process. Which leads finally to the last stage: the Return to Health and normal day activity and night relaxation. You have plenty of energy in the day, and you sleep well and get restored at night. So in this system, as with The Healing Codes, we’re always looking for that original stressor–that trauma, that Original Event that caused the brain to register a stress response. When we address that, the body begins to move toward health, and as it does so, physical things come up. We think we’re getting sick, but we’re really getting better at the point when the symptoms show up. A fever is a good example. When some infectious agent enters the body, the body responds with a fever to raise the temperature to kill off the attacker. You think you’re sick, and maybe take some aspirin or ibuprofen, but that actually blocks what the body is trying to do. If we can respect the body’s wisdom, find and address the root cause (the trauma or trigger), we begin this regeneration process. Isn’t that wonderful news? Doesn’t that give you great hope? When the symptoms show up–that’s when your healing has started! It does take a big paradigm shift, though, for many people. All I can say is, “Try thinking this way.” Try going for the original trauma by asking, as we counsel with The Healing Codes, “How do I feel about this condition?” Then trace that feeling back to other times you felt this way (about anything), and use The Healing Codes and prayer to heal that negative memory, image, or belief. META Health, the New German Medicine, functional medicine, energy medicine–all these approaches seek to find and heal the original cause, rather than try to make symptoms disappear. Will you trust your body’s and your heart’s innate intelligence, and look to heal the SOURCE of whatever bothers you? I hope you will.